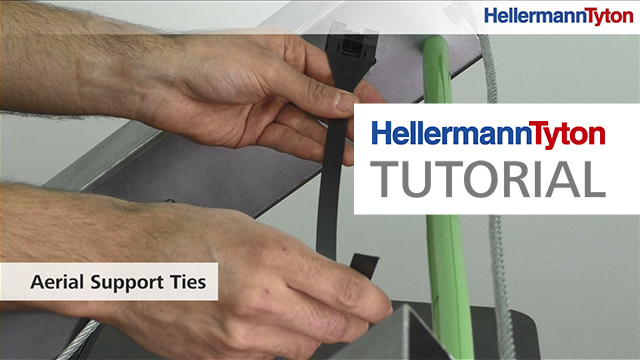 A brief, step-by-step tutorial showing how to properly mount an Aerial Support Tie. See how the Blind Hole Mount is used and removed. Q-Series video showing the entire product line including Q-Ties, Q-Mounts and Q-Tags. Check out the versatile and easy-to-use design of this innovative clamp. The Cable Tie Saddle feature of the Ratchet P-Clamp. The Releasability feature of the Ratchet P-Clamp. The Soft Insert feature of the Ratchet P-Clamp. The Tension Tab feature of the Ratchet P-Clamp. Demonstration video that shows how to use the M-BOSS Compact metal embossing system. Learn how Paint Mask Labels self-protect their data, even after being painted over. An overview showing how easy it is to use print automation to speed your label creation and printing workflow while greatly reducing errors. Get to know this incredible, liquid-tight conduit fitting. Video showing how to use the Helawrap line of products. Discover the convenience and capabilities of this automatic cable tie tool. How to video that shows how easy it is to adjust the tension settings to any of the 33 pre-set tension settings. How to video that shows how to simply replace the blades on the EVO 7 tool. How to video that shows how to lock in any desired tension setting. See how our patented Tension, Lock, CUT (TLC) technology works. Cut explanation. See how our patented Tension, LOCK, Cut (TLC) technology works. Lock explanation. See how our patented TENSION, Lock, Cut (TLC) technology works. Tension explanation. How to video that shows how to calibrate the settings on the EVO 7 tool on site. How to video that shows how to use the EVO 7 tool in an actual application. Learn how to terminate a jack using the GST Pocket Tool. Demonstrates the process of terminating a HellermannTyton Cat5e jack with the HellermannTyton punch tool. How to video that demonstrates the process of terminating a HellermannTyton Cat5e jack with a termination tool. How do we design the components to keep performing season after season? Especially as residential solar installations skyrocket. PV labeling requirement changes coming in NEC 2017. How to ensure passing inspection using the latest NEC, International Fire Code and National Fire Protection Agency requirements as your guide. Great and not so great examples of solar installation wire management, and how this part of the installation affects maintenance, operation and performance.